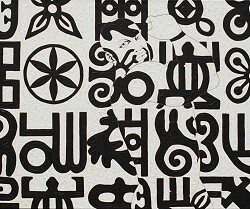 The past year (2007) was extremely successful for Ghanaian painter Owusu-Ankomah. Important museum exhibitions in the USA and participation in internationally significant art events as well as the acquisition of important private and public collections mark crucial cornerstones in the international career of this extraordinary artist. We are very happy, to be able to have a comprehensive display of artworks by Owusu-Ankomah in our gallery rooms, this year again. Under the title "STEPPING OUT" we present works from the years 1990 to 2008. Some masterpieces of the artist are shown on this occasion for the first time publicly. We welcome you during our opening hours or outside by appointment in the gallery.